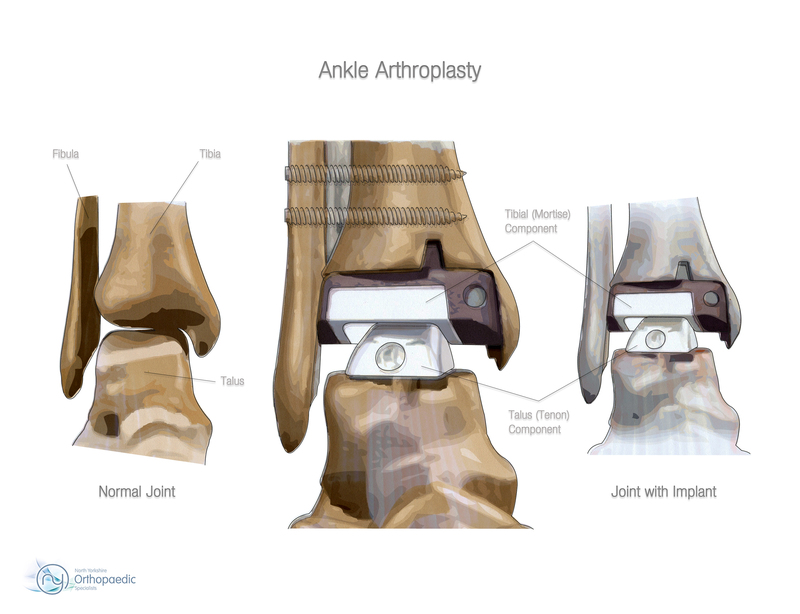 Over the last 10 years ankle arthroplasty has been growing in popularity as the implants available for replacement have improved. Current studies indicate about a 90 percent patient satisfaction rate in the first four years after surgery. In addition to providing pain relief from arthritis and destroyed joint surfaces, ankle replacements offer patients better mobility and movement compared to fusion. By allowing motion at the formerly arthritic joint, less stress is transferred to the adjacent joints. Less stress results in reduced occurance of adjacent joint arthritis. The skin incision will be primarily in the front of the ankle with smaller incisions on the outside. 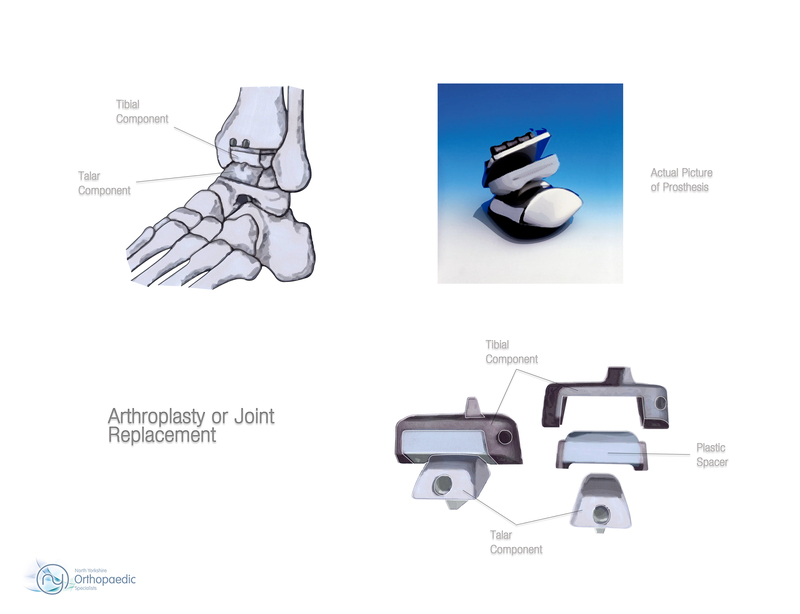 The foot bone is replaced with a smooth metal surface and a high-density polyethylene (plastic). The patient will wake up from surgery in a dressing that is hard in the back and soft in the front which will protect the foot and ankle and allow swelling. The surgery itself takes approximately two and a half hours. Patients are given a combination of intravenous and oral narcotics to control the pain postoperatively. If a patient has the surgery under a block the leg may remain numb for six to 18 hours after surgery. Your consultant may recommend physical therapy for several months to help you regain strength in your foot or ankle and to restore range of motion. Ordinary daily activities usually can be resumed in three to four months. You may need special shoes or braces. The vast majority of these surgical procedures move forward without risk. There are also rare cases of pain syndromes reported from any foot ankle hand or arm surgery. There are also risks of anesthesia which you should discuss with the anesthesia team.